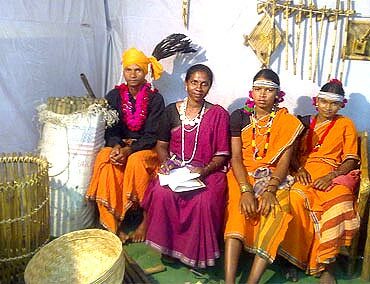 Sociologist Nandini Sundar has been doing research on Adivasi issues for the last twenty years. She is the author of Subalterns and Sovereigns: An Anthropological History of Bastar (1854-2006). Along with two others she filed a public interest litigation in the Supreme Court in 2007 against the excesses of the Salwa Judum, the anti-Maoist organisation of tribals in Chhattisgarh. I don't think there is a consensus that development should take precedence over counterinsurgency. If you listen to Times Now (the television channel), (its editor-in-chief) Arnab Goswami is calling for a war between India versus the others, as if these Adivasis living in Chhattisgarh are not part of India. The rehabilitation plan which the Supreme Court had asked us to prepare, was drawn up precisely to address the situation of people living in this war-like atmosphere. We have looked at the war situation and tried to see what needs to be done immediately for rehabilitation. Apart from a high-level committee we have suggested a survey to be carried out by local college youth and retired district judges to be posted in the block headquarters to hear complaints. Ultimately for anything to work there will have to be peace talks -- that clearly is the bottom line. It has been months since the Supreme Court expressed displeasure against Salwa Judum. But it is still around. What is the status/update of your case? Our case has been going on since 2007. There are two cases. One filed by (historian) Ramchandra Guha, (former Union secretary) E A S Sarma and myself. And the other filed by Kartam Joga, Dudhi Joga and Manish Kunjam who are local residents. Unfortunately the government is completely in contempt of the Supreme Court and does not follow any of the orders that it is meant to. In 2008, when the NHRC (the National Human Rights Commission) had given its report about what is happening, the Chhattisgarh government filed an affidavit admitting that houses had been burnt by the Salwa Judum. They had agreed to compensate and rehabilitate people. But till now they have not prepared any compensation plan and have done nothing about it. This year, in February, the court asked us to prepare a comprehensive rehabilitation plan for all victims whether killed by Salwa Judum, the security forces or the Maoists. People who have been killed by the Maoists are already being compensated. Compensation therefore needs to be provided for those who have been killed by security forces and Salwa Judum who currently are not recognised as a category at all. It is quite shocking that the Chhattisgarh government has denied that there are people living in the villages who need to be rehabilitated. They have denied that there are any people living in Andhra Pradesh who need to be rehabilitated or people who have been affected by the Salwa Judum. According to them the only people who are worthy of rehabilitation are the people in camps. Those living in camps are approximately 25,000 to 30,000 as most people have gone back to their villages. The population of the affected villages is roughly about 3 lakh (300,000). 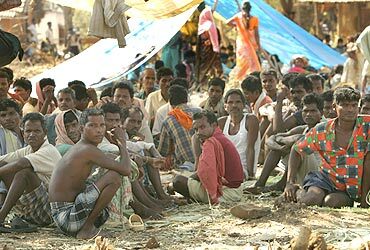 The government is only willing to talk about these 25,000 people as residents of Dantewada and Bijapur combined. The data submitted by the government in court is exactly the same as what they had submitted in 2008 including the number of students, teachers, toilets in the camps. They have picked up the same affidavit, changed the number on the annexure and passed it off in 2010. So the government of Chhattisgarh is completely callous and indifferent to its own population. The current situation is that the Supreme Court has asked them to file a status report on the FIRs (First Information Report) they have filed and other action taken on the 114 cases indicated by NHRC for further enquiry. . They have also been asked to respond to the suggestion we made of a high-level monitoring committee. What is your opinion of the legality of the SPOs (Special Police Officers) who are at the forefront of the government's operation against the Maoists? First of all, initially when these SPOs were appointed they were minor/underage and there are government records (memorials) and photos that prove it. There was no procedure for their appointment. Often it was because they needed a job, they were known goons or criminals, or ex-Maoists. So it was a mixture of people. Now whatever the legalities of their appointment are the fact is that they are ensured full impunity by the state. These SPOs cannot go back to the villages because they have been involved in burning houses and killing people, now they have become completely lawless. Whenever there is a complaint against these SPOs they are never arrested or charge-sheeted -- nothing happens to them. So the way that they are handled is completely illegal. There is no rule of law as far as they are concerned. They are not obliged to follow the law. Secondly, this has put some people in a very vulnerable situation as they will be left stranded. After the war, what are they going to do if they can't go back? Thirdly, SPOs are only paid Rs 3,000. When they started off they were paid Rs 1,500. These people have no backing like other regular police constables, in terms of pensions etc. They are not trained properly either. They are being made to risk their lives. How do you view Home Minister Chidambaram's initiatives and response against the Maoists? Unfortunately, the home minister seems to be obsessed with civil society actors and he has no grasp of the situation at all. For a home minister to say that it is the functioning of democracy, (which allows us to file PILs or engage in debate) that is the problem rather than years of neglect by his own government or the actions of the Maoist themselves is shocking. Is he someone who believes in the Constitution? Does he believe in democracy? Or what? For him to say that the Unlawful Activities Prevention Act should be imposed against people who have supported Maoism is also shocking. In fact, the first people who should be locked up should be his own Congressmen like Mahendra Karma (the former Chhattisgarh minister who formed the Salwa Judum). It is because of Salwa Judum that recruitment to the Maoists has gone up hugely. So the home ministry officials, Chhattisgarh officials, BJP (the Bharatiya Janata Party) etc who supported Salwa Judum should be the first to come under this Act. The home minister has been so belligerent; talking about war, then flip-flopping, claiming that Operation Green Hunt was a figment of the media's imagination and then wanting to have talks. I think he really does not know where he is going with this entire situation and has no sense of the ground reality. He may be good on a corporate board, but he certainly does not make a good home minister in this particular situation. Is the state of civil rights deteriorating under the second UPA (United Progressive Alliance) government? If yes, what are the reasons? I can't say whether it is deteriorating as civil rights in this country have never been very good. The targets shift from time to time. The whole targeting of Muslim youth during the BJP, of course, is a well known fact. I think some of that has continued under the UPA . But right now the people being targeted are a whole variety of people. Just anybody who expresses criticism of the government's Naxalite policy is seen as a Maoist. Could you highlight some strengths as well as weaknesses of the Maoists? I think the strengths are that they do have popular support; the bulk of their cadre is Adivasi or Dalit. When you look at other political parties, they do not really represent the interest of that class the way the Maoists do. There are particular ideas that they have; for example, the village economy and promoting Advasi language which I think are strengths. Also for the local population, most people seem to be happy with the sort of land distribution they have carried out in Chhattisgarh and the increase in the prices of tendu leaves. As for the weaknesses I think militarisation is their biggest weakness. The fact that they have moved from any kind of mass public action and are focused predominantly on guns is a serious problem. Also, I think, you cannot even at a village level have democracy with armed people. In the long run if they have to survive they will have to come out into some sort of open democratic politics. Obviously the weakness is that this kind of politics allows you to get away with these so-called mistakes, which are actually not mistakes but an inevitable consequence of such militarisation. I am not clear how their armed struggle is in the long run interest of the Adivasis or where it will end, because of the severe repression that it has brought upon these societies. Though, of course, the repression is the government's doing, and the government has other alternatives. 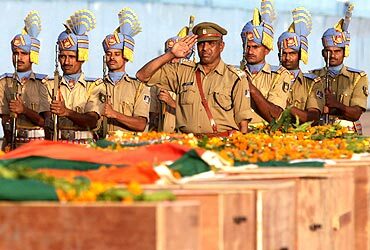 Image: CRPF men pay their last respects to fallen colleagues massacred by Maoists in Dantewada. Are civil rights activists, who speak against the State's actions against the Maoists, under threat or pressure from the state or central governments? Clearly they are. Binayak Sen was locked up for two years, Himanshu Kumar's ashram has been demolished. There are people who are being arrested in other parts of the country. This includes various journalists in Chhattisgarh who have been arrested or threatened; one of them was booked under the Chhattisgarh Special Security Act. Also, for instance, Home Minister Chidambaram's statement that the Unlawful Activities Prevention Act should be applied to anyone supporting Maoists. I think that they are obviously being threatened. I personally was not allowed to travel freely in Chhattisgarh when I was there the last time. I was followed by 12 armed officers in two unmarked cars. Even though we went to tourist spots they were standing behind us in a line. They literally followed us to the bathroom, it was crazy! If they are going to use 12 SPOs to follow someone like me, then obviously they are not targeting the right people. Is this their idea of great anti-Naxalite operations? I wasn't doing anything, just traveling, meeting people who I have known for 20 years. In recent attacks, several civilians have been killed by the Maoists. How can anyone justify the killing of civilians? I don't think any one can justify the killings of civilians. I think it is quite shocking that they should have done this blast. The SPOs were wrong to board civilian buses. The fault is on both sides, the CRPF should not occupy schools and the Maoists should not blast them. But knowing that there would be innocent civilians on that bus and killing them is a horrible thing to do. In your opinion, what has been the role of the media in terms of accuracy and bias relating to the Maoist struggle? I think the role of the media has been terrible. There were no reporters and there has been no reporting about the Maoist struggle for years. For a whole year after Salwa Judum (was formed) there was no Indian media which had got into the area. The first reports about this actually came from The New York Times and The Guardian several months later. This was covered after a year by Outlook and Tehelka. A situation where village after village is getting burnt, people are being forcefully taken to camps and we have no reporting! The media is dominated by the middle class where only a few people have genuine sympathy for the masses, but the majority are cynical and self absorbed in their own class interest. The media as an industry is dependent upon advertising and corporate capital. I am tired of having these open debates (on television) where they want to have all voices represented. They call in someone to present the Maoist view, but it is not a medium that allows for serious debate or reflection. I don't think the media is actually interested in promoting peace. I think the media has been one of the biggest culprits for this negligence. Also, when they do report on the Maoists, for example, in the case of Salwa Judum they were only interested in getting interviews with the Maoists because it is glamorous. People with guns have cache in a way that unarmed victims of violence do not. I have tried so hard saying forget about the Maoists; interview ordinary villagers and see what is happening to them. I requested many people in the media to cover their stories. I shared the testimonies we had from victims. There was complete silence. I contacted TV channels requesting a debate on Salwa Judum, there was still complete silence. Now because of Operation Green Hunt and Home Minister Chidambaram's speeches , it has come into the media glare. But even now, where is the reporting on villagers killed in Green Hunt? All we have is the government's statistics -- nobody is questioning them. I have heard that over a hundred villagers have been killed in Dantewada alone since Green Hunt began. If people had taken note of Salwa Judum five years ago, we would not be in this kind of situation today. So I fully blame the media for what is happening today. 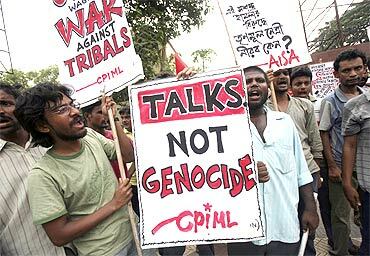 Image: CPI-ML activists in Kolkata protest government action in Lalgarh, West Bengal.